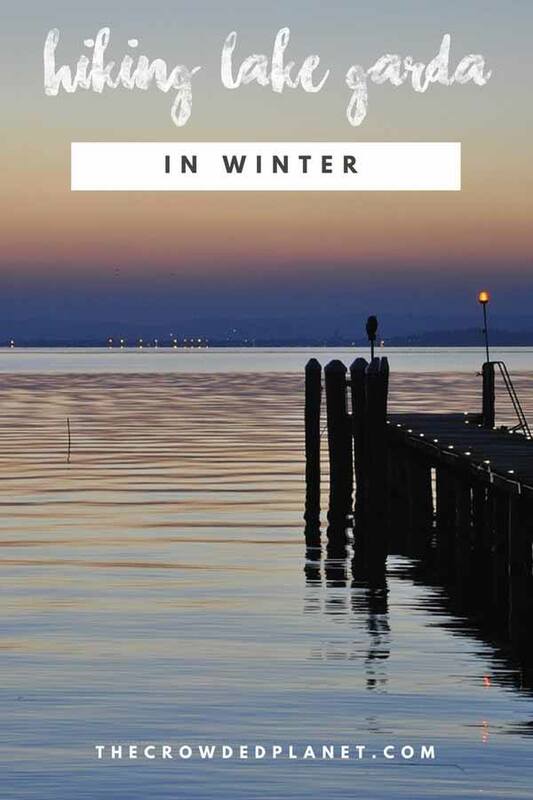 Are you looking for the perfect winter hike in the Lake Garda area? Follow this guide and hike to Rifugio San Pietro, a lovely mountain hut with wonderful views over the lake! We woke up with sunshine streaming from our hotel window. After days of grey skies, darkness, and annoying rain, we could see the clouds floating away from the lake, disappearing over the mountaintops to the north of Lake Garda. It was the perfect day for a winter hike – as we walked out, bound for Rifugio San Pietro with our backpacks, we could feel a touch of warmth in the air, and see touches of gold in the light sparkling over the lake, sign that winter was about to end. 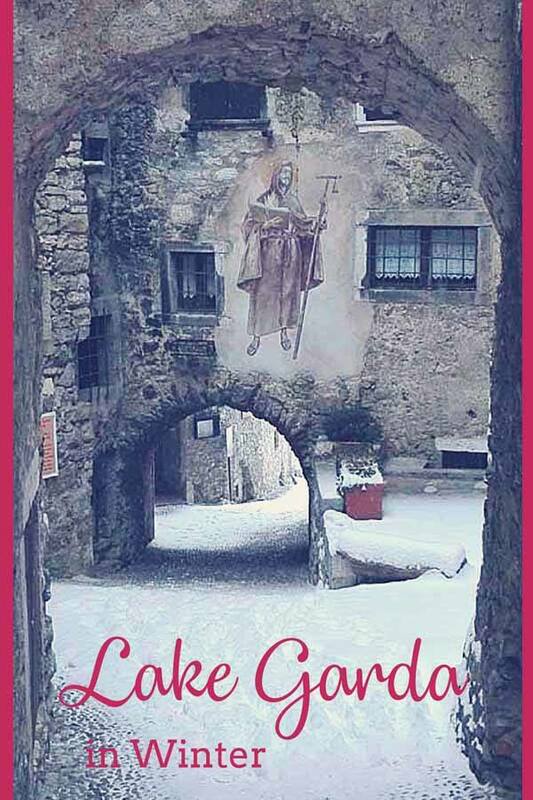 Hiking around Lake Garda… in winter! One of the reasons why we love Lake Garda so much is that it’s truly a year-round destination – and that includes hiking. 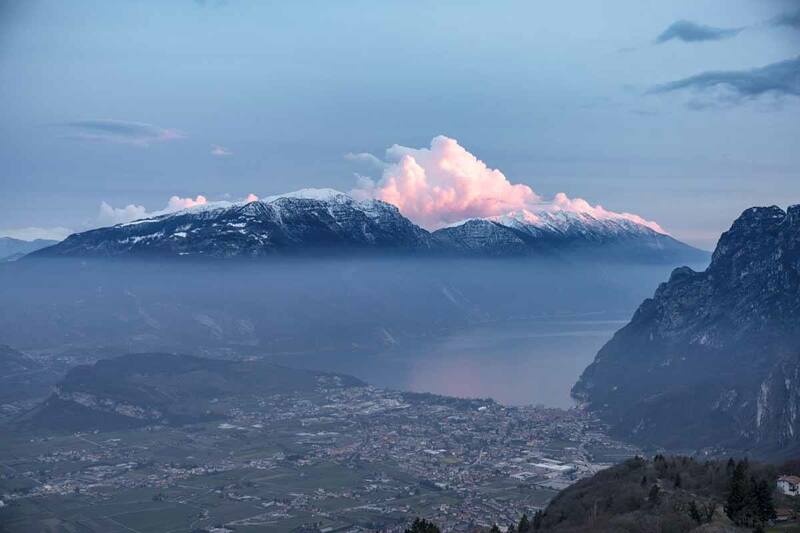 Elsewhere in the Alps, winter hiking becomes an endeavour reserved to mountain connoisseurs and snowshoe enthusiasts – but thanks to its mild climate, it’s possible to hike all year around Lake Garda without special equipment. 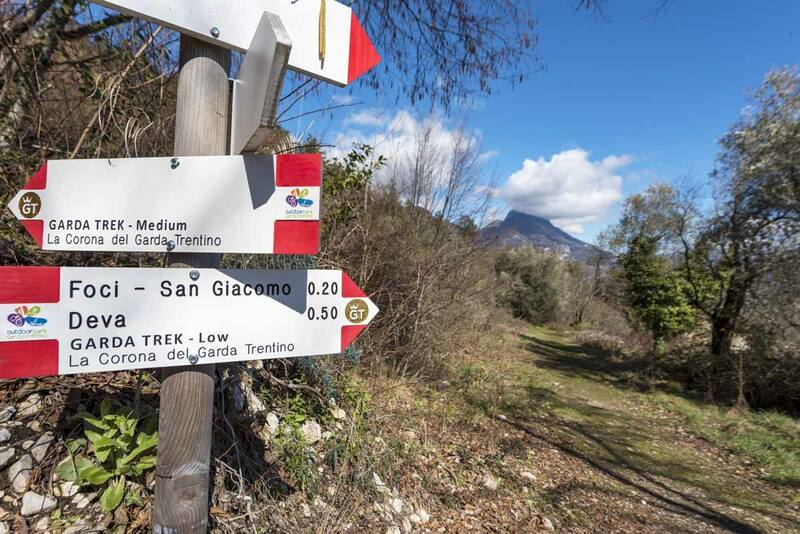 GardaTrek is a recently-opened trail network covering Garda Trentino, the area surrounding the northernmost tip of Lake Garda. There are three loop-shaped trails at various heights, making it possible for visitors to hike around the lake and its mountains all year round. In summer and autumn we covered the Top Loop, the highest of the three, traversing ridges and mountaintops, and staying in two wonderful mountain huts – Rifugio Pernici and Rifugio Damiano Chiesa/Altissimo. GardaTrek is signposted really well! 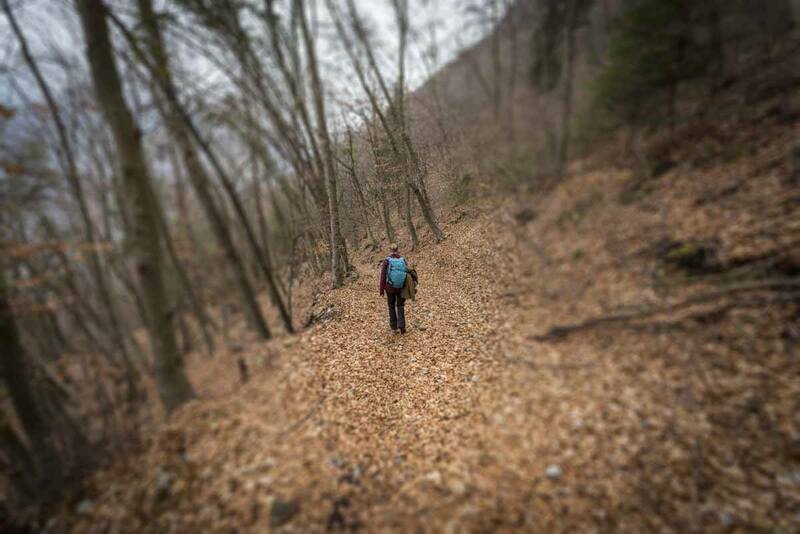 Winter is the ideal time to hike the Low Loop, crossing several Garda Trentino towns and villages, and never climbing above 500 meters above sea level. 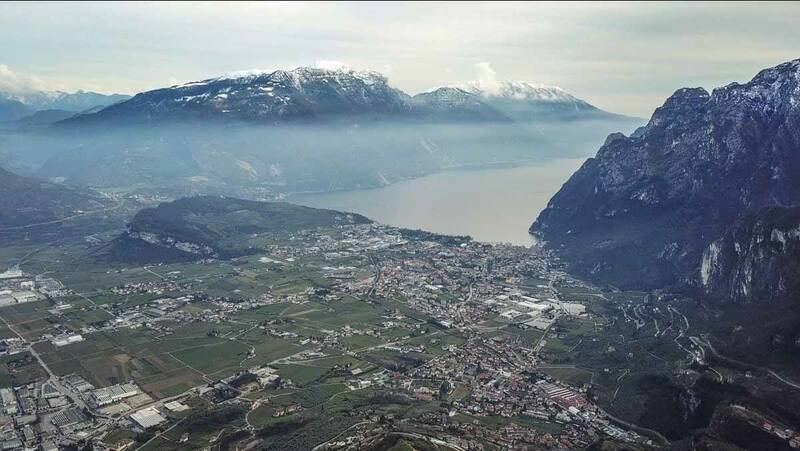 Our plan for the day was hiking from Riva del Garda to Rifugio San Pietro, also known as ‘Lake Garda’s balcony’, because of its scenic location overlooking the lake 1000 meters above, covering sections of the Low and Medium Loop. We started our hike from Riva del Garda in the late morning – our first destination was the Bastione, a 16th century stone watchtower destroyed by French troops in 1703, overlooking the lake 200 meters above its shores. The path up to the Bastione starts from via Monte Oro in Riva, and switchback after switchback, we got to the tower after approximately 15 minutes. From the Bastione, we could see the rooftops of Riva in the valley below, and the lake stretching southwards, shining in the midday sun. The mountaintops around the late were dusted with snow, with fluffy, wispy clouds surrounding them like crowns. 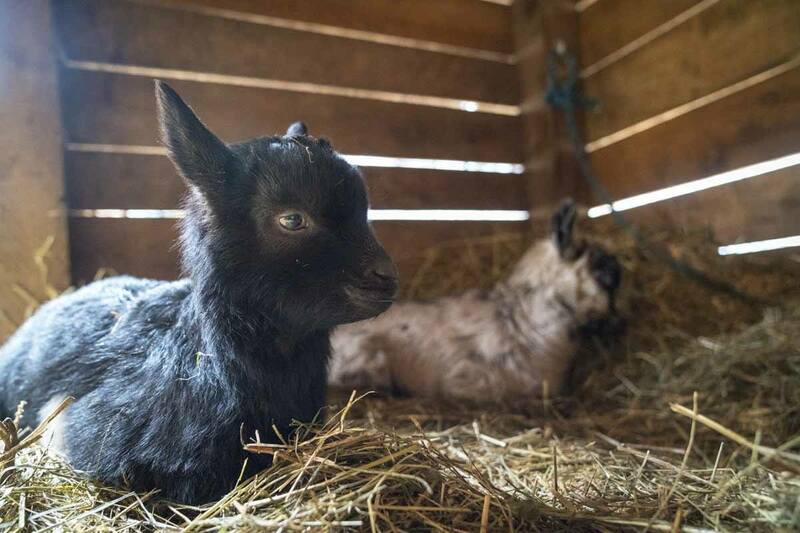 Between us and the lake were row of vines, silvery olive trees and some lone cypresses – not the kind of plant life you associate with the Alps, and one of the secrets behind Lake Garda’s charm. The Low Loop path – still quite easy! After admiring the view from the Bastione, we continued following the Low Loop signs, bound for Santa Maria Maddalena, the little ruin of a church dating back from 1200. It got warmer as the day went by, and soon enough we were walking in t-shirts. 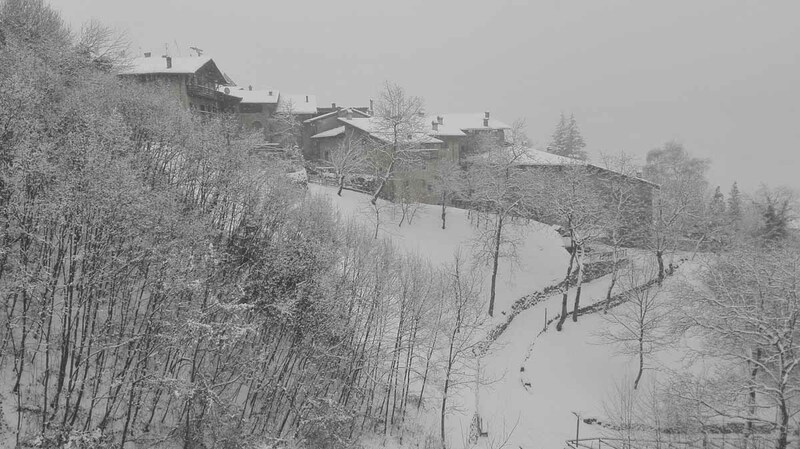 It seemed incredible to think that just two weeks previously, one of the late-winter storms raging all over Europe had reached even Lake Garda, covering palm and olive trees with a soft blanket of snow. The path was wide, covered in tiny brown leaves and bordered by trees and dry stone walls. 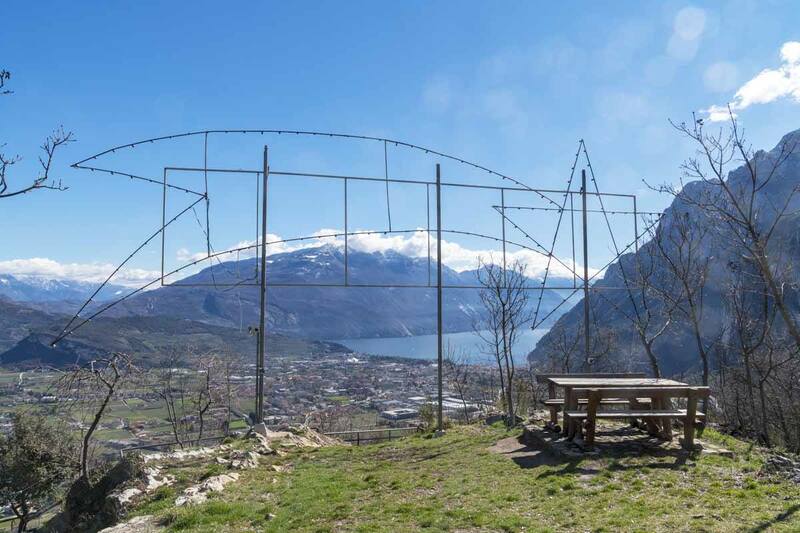 We followed the GardaTrek signs with their crown-shaped markers all the way to San Giacomo, when the trail descended reaching Riva del Garda’s northern outskirts, before climbing again and crossing the provincial road to Tenno a couple of times. After passing Deva, please be careful – you may be tempted to cut through the switchbacks, but by doing so you’ll probably miss the Low Loop sign located on the edge of one of the twists, and end up walking along the road even though it’s no longer necessary. 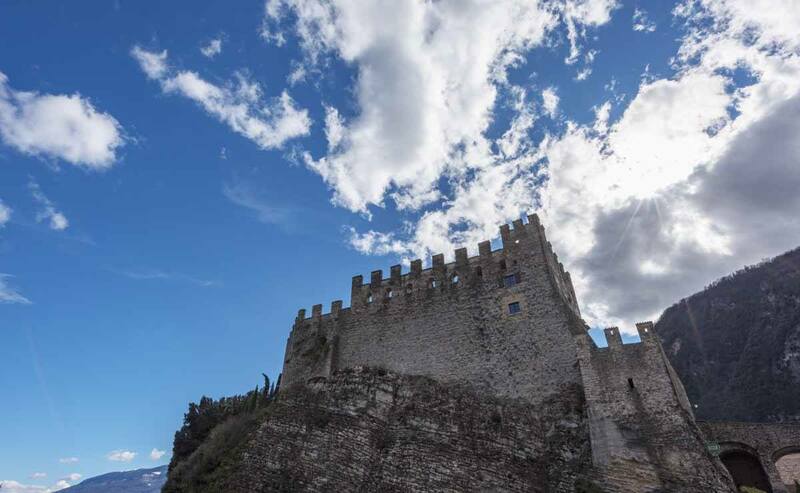 Tenno Castle – doesn’t it look like the quintessential fairytale castle? When you reach Deva, you’ll be able to see the squat silhouette and crenellated battlements of Tenno Castle, blending with the rock below, on the other side of the valley. If you’re on the Low Loop, just follow the crown markers all the way up and down the valley to Frapporta, a tiny hamlet just south of Tenno, past San Lorenzo, a small Romanesque church covered in frescoes and surrounded by vines. On the other hand, if you missed the Low Loop turn like we did, fear not – a couple of turns later you’ll see another path on your right hand side, leading down the valley through a deciduous forest, then across a stream and finally up into Tenno. We reached Tenno in the quiet time of post-prandial slumber. There was not a soul wandering the streets, save for a few cats that we just couldn’t resist cuddling. Our ‘variant’ had made us bypass the historic centre, but instead of continuing on our hike we walked through it, headed to the Grom Belvedere, the most scenic viewpoint in town. The Belvedere is on a hilltop right next to Tenno Castle, dating back to the 12th century and looking like a castle from a fairytale – sadly, it’s not opened to the public. We had lunch on a picnic table under a giant comet, which is lit up at Christmas time. Then, we left the GardaTrek paths briefly and took the 406B out of Tenno towards Ville del Monte, four mountain hamlets belonging to the Tenno municipality. 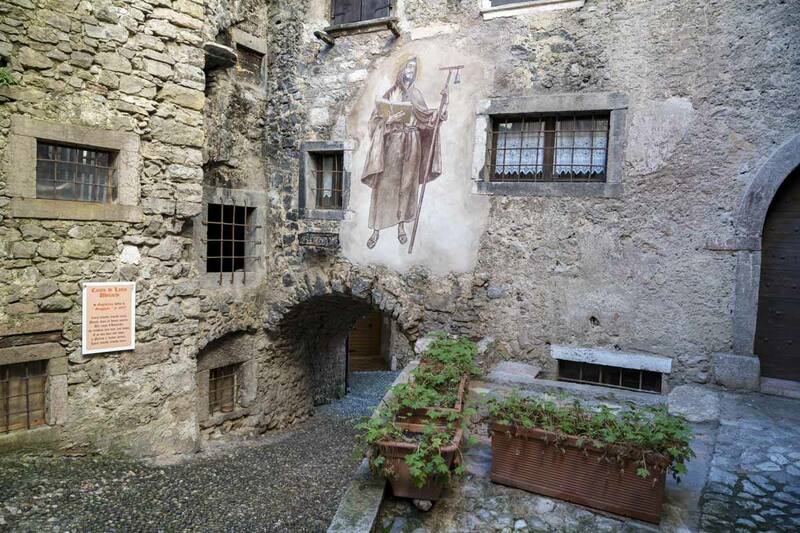 One of them, Canale di Tenno, is one of the best-preserved examples of Medieval architecture in the Alps, abandoned after World War I and brought back to life in the Sixties, thanks to a group of local artists. Canale di Tenno is one of those places that truly gives its best on a winter afternoon, with no other visitors in sight (except for cats, once again). The village is made of cobbled, twisted streets converging in a single square, and it gets incredibly busy in summer and December, when the village hosts a popular Christmas market. The houses of Canale are still original, made of stone and wood, and connected by arches and passageways. There were flowerpots with fiery geraniums, old tools on the balconies, and some of the façades were painted or decorated with colourful banners, in keeping with the ‘medieval mood’. There were also some tongue-in-cheek signs, like one warning visitors not to litter, or else they would risk being put in the stocks and spat upon in the public square. I could see how the picturesque atmosphere of Canale di Tenno could easily become twee, and attract hordes of day trippers ruining the peaceful feel of the place – but that sunny afternoon in early March, Tenno looked suspended in time, an enchanted place that could disappear with a spell. And if my pics of Canale don’t convey how magical it is, this is what it looks like in the snow! We would have loved to stay in Canale, but we had one last stretch to hike before reaching Rifugio San Pietro, located approximately 500 meters above the village. Luckily, the day’s walk up until that stage had been fairly easy, because the last stretch was quite steep and uneven, snaking up the mountain through an oak and pine forest. A real test for the legs, considering that we hadn’t been hiking since our adventure along the GR1 in October! The last ascent took about 40 minutes until we reached Rifugio San Pietro, perched on a hilltop, where we got our third – and best – Lake Garda view of the day. The sun was setting, and the mist rising from the lake, filling the valley with a mysterious, silvery shroud. Clouds danced over the mountains, getting thicker by the minute – the sun came out one last time, painting the valley with deep pink brushstrokes, and then it was gone. I’ve said many times that when visiting mountain huts, visiting the rifugisti (people running the huts) is half the fun – and Andrea was no exception. He’s been running Rifugio San Pietro for three years, after extended periods of travelling all over the world, including Australia. Andrea lives in the Rifugio with a true menagerie of furry friends, and each of them has a specific ‘job’ – the oversized pup Ben sprinkles good mood all around, and wards off foxes and predators, the tiny, cuddly kitten Mea is a fierce mouse killer, Giorgio the pig eats all the kitchen leftovers aided by the chickens, who also provide fresh eggs, and the lambs, goats and hares keep the grass low and add a little extra cute factor to this unusual mountain family. Unlike the majority of mountain huts we’ve stayed at over the years, the facilities at Rifugio San Pietro far exceeded our expectations. The hut can be reached by car – Andrea’s 4×4 gets all the way to the hut, whereas guests are asked to leave their car at the nearby car park and walk the last 500 meters through the forest. 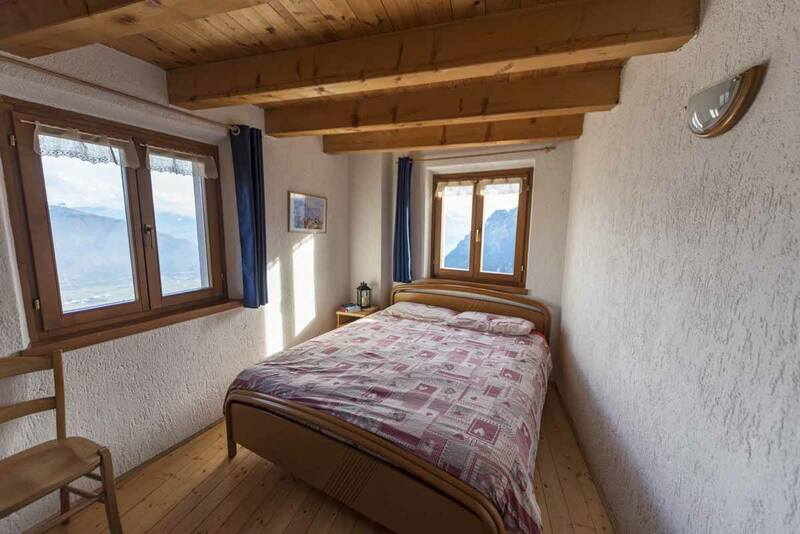 The hut has double rooms as well as dorms, a true rarity in the Alps. Not to mention, the food at Rifugio San Pietro was excellent, with a menu full of hearty, home-cooked dishes. We started with a beer and a selection of cured meats and cheeses – Andrea promptly informed us where each and every product came from. Then, we shared a huge portion of homemade gnocchi with ragù, roasted rabbit and capriolo (roe deer) stew with two types of polenta, yellow one with four types of mountain cheeses and black buckwheat polenta. The day after, we woke to a grey, miserable day. We had planned to hike down to Tenno and then to Riva via path 401 through Val di Gola, but when we reached Canale the rain got heavy, and we simply had enough, so we got a lift. Walking down – THIS looks more like winter hiking! Before returning home, we stopped briefly on the lake shore. A heavy curtain of rain-laden clouds was stacked over the mountains. Mist rose slowly from the lake, playing peekaboo with the view. 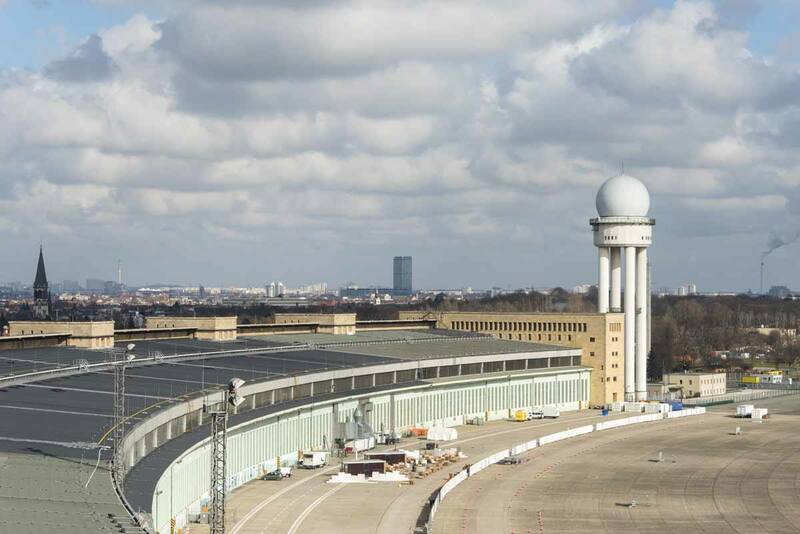 The place still had its charm – a mysterious, winter-in-Mitteleuropa kind of charm. After all, we’d come to Lake Garda for a winter hike, right? 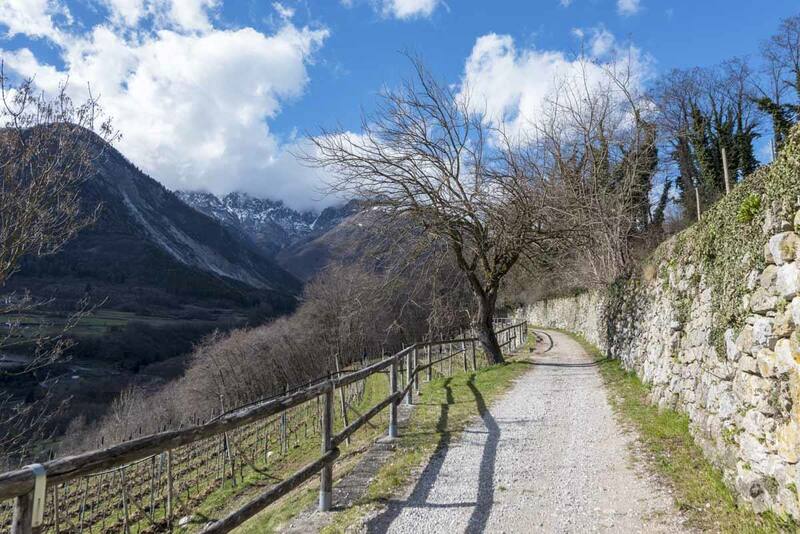 If you want to hike the same way we did, you’ll need to get to Riva del Garda first – if you’re driving we recommend taking the A22 to Rovereto Sud and following signs to Riva del Garda. Otherwise, take the train to Rovereto and then a bus to Riva del Garda. 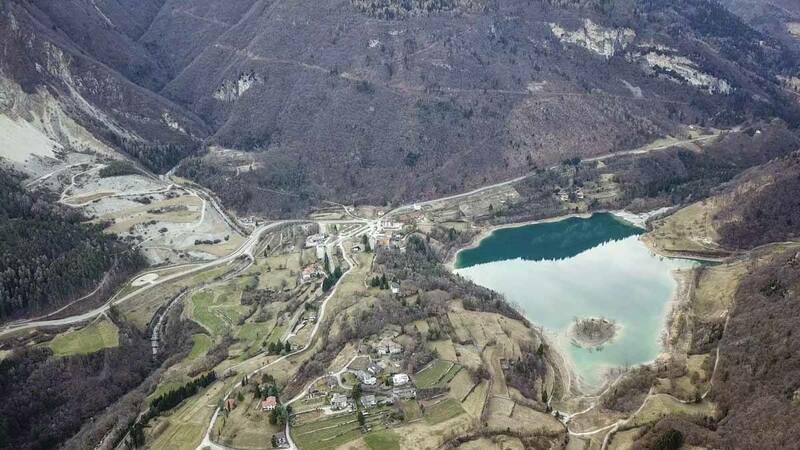 There are several car parks in Riva, and some hotels will allow you to leave your car in their car park when you’re hiking provided you spend one night with them before or after. 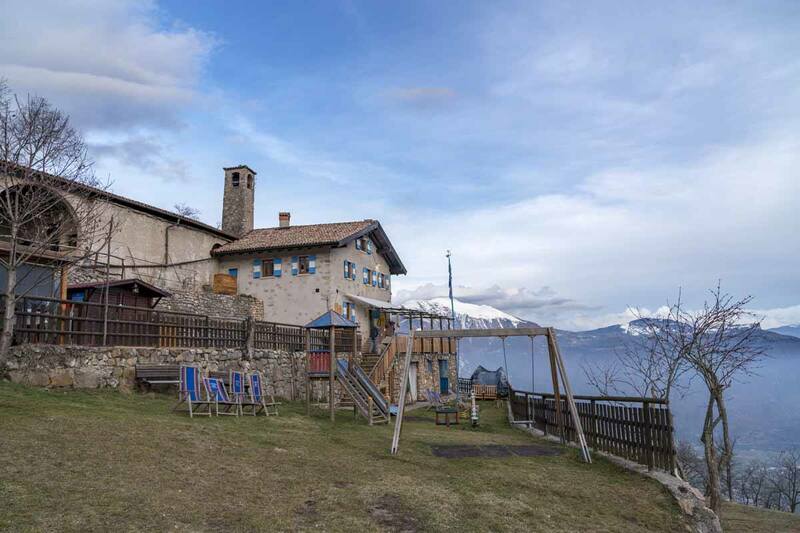 Rifugio San Pietro is open year round, except for a month in November. In winter they’re only open between Thursday and Sunday night. 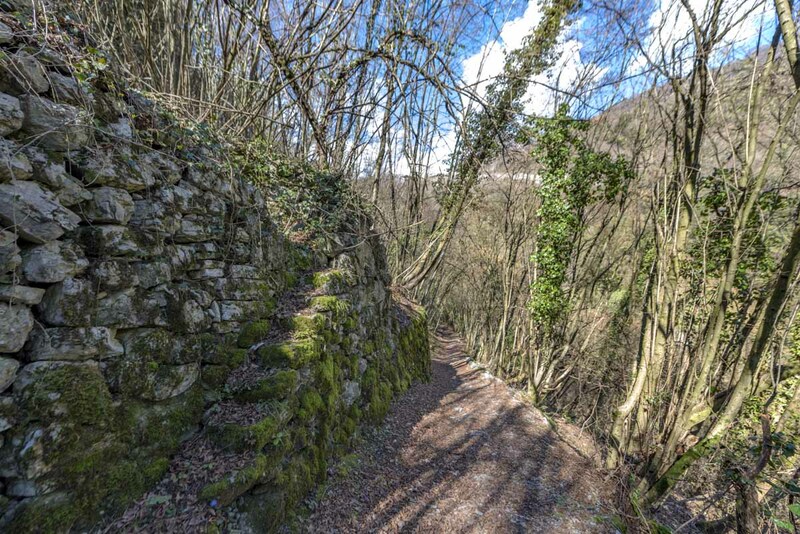 If you don’t want to hike from Riva, you can catch the bus to Tenno and hike from there – it takes about one hour each way, via Canale di Tenno. We would like to thank Vale Bellotti from Garda Trentino for making this experience possible. 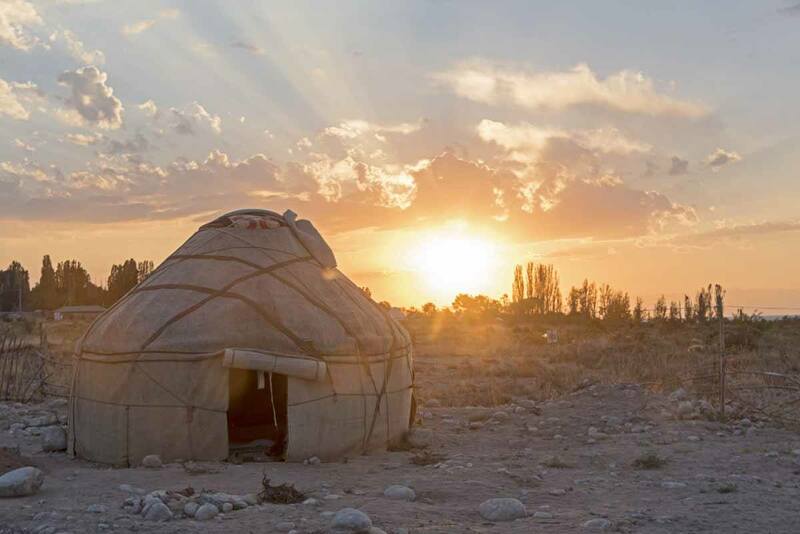 Once again, we really enjoyed this winter instalment of GardaTrek!